There’s nothing better than fresh Hake, it’s super versatile, flavourful without being overly fishy, and is a favourite for many South Africans. Hake doesn’t dry out as quickly as Yellowtail or other game fish so it’s great for beginner cooks. Fresh Hake is firm, has a fresh “ocean” smell and slightly translucent flesh. I discovered, at a workshop hosted by the Marine Stewardship Council (MSC), that our Hake fisheries are MSC certified. The objective of the Council was to inform businesses in the seafood industry about their ECO labels and how buying MSC-certified fish can promote our businesses to the local and tourist markets as well as protect our marine resources for future generations. At the workshop I was introduced to the book, Fish Tales written by Bart van Olphen and Tom Kime and published by Penguin South Africa. The book introduces MSC certified seafood from around the world, tells a story about the seafood, the fishing methods and the environmental impacts and offers some delicious recipes. I have, with permission from Bart van Olphen, selected a spicy fish soup recipe from the book to share with you. 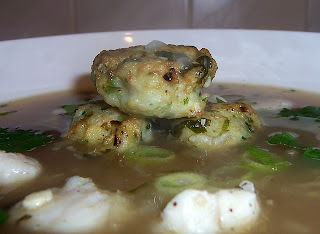 This is a very refreshing, deliciously spicy soup, which is made rustic and hearty with the addition on mini fishcakes. It is full of clean flavors from the chilli, lime leaves and lemongrass. You can use a combination of fish in this soup as well as the fishcakes, prawns or clams. Don’t be put off by the amount of ingredients. I found all the herbs, limes and tamarind at the Onderstuen Handelaars in Salt River, Cape Town. Also note that I felt that the soup needed a little sweetness so added 2 tablespoons brown sugar which is not in the original recipe. Place the fish and all the other ingredients into a food processor. Fry in medium heat oil until golden brown, do not cook until well done as they will continue cooking in the soup. 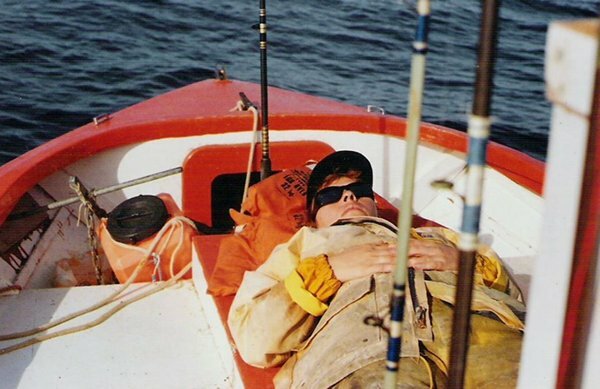 My Mom, Maree taking a break! Add the tamarind liquid, the orange juice and the fish sauce. Turn the heat off and allow the fish and the fishcakes to cook through in the residual heat from the soup.